ADA Mats are Raised, Truncated Domes for the visually impaired, designed to alert blind pedestrians to safety hazards such as street crossings. 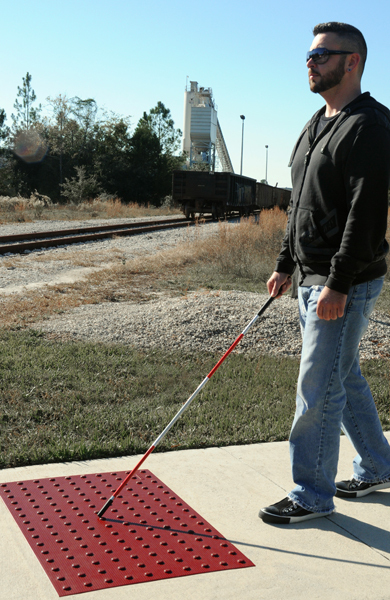 It is a legal requirement to use ADA Mats (Detectable Warning Systems) in order to comply with the Americans with Disabilities Act, and Ultra® ADA Mats are the Best ADA-Compliant Mats around. These detectable warning tiles are large plastic tiles that you either set into contract during construction or apply with adhesive to pre-existing concrete in order to comply with regulations. When visually impaired people encounter the raised, truncated domes with their feet, they are alerted an upcoming intersection or other danger.